2016 has been the year of the cover album in classic country. Projects that either partly, mostly, or exclusively feature previously-released material have made up a healthy portion of the release cycle, including the new records from John Prine, Willie Nelson, The Time Jumpers, Dale Watson, and many others. Though many of the old country standards or greatest hits from your favorite artists will never get old, it can be frustrating when you’re looking for something new that speaks to you similarly to how those older songs did when they were originally released. As has been widely reported, older music is now outpacing newer music as far as sales, speaking to both the quality of new output in the marketplace, and the pull of nostalgia on many music listeners for music, artists, and songs that are familiar. Unless you count yourself among one of the dedicated followers of Cajun music, you’ve probably have never heard the name Courtney Granger. And looking at a picture, you may surmise he looks like a better candidate to fix your laptop than turn in an incredibly-surprising cover album of classic country songs crooned out with such haunting authenticity it sends shivers down the back of your neck. But that is what you get with this new record Beneath Still Waters. Courtney Granger is Cajun music royalty. The grandnephew of the formidable Balfa Brothers, Courtney grew up surrounded by the music of Southern Louisiana, and currently holds a seat as the fiddle and accordion player for the internationally-recognized Pine Leaf Boys. In the Cajun world, he’s akin to a country star, but what even many Country Granger and Pine Leaf Boys fans didn’t know is that under the surface of Courtney’s Cajun roots laid a strong passion for classic country, and even more importantly, and acumen and gift to express it with incredible depth, passion, and command. 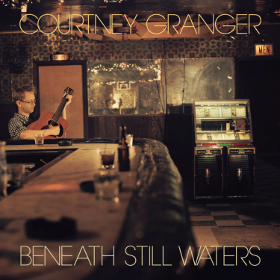 Beneath Still Waters is a covers album of old classic country tunes that are familiar enough that you may recognize a few, but others will probably be new to you. 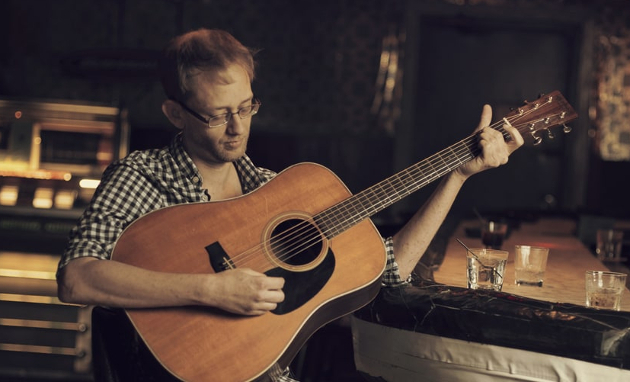 Dallas Frazier, Max T. Barnes, Hank Cochran, Hazel Dickens, Cindy Walker, and Keith Whitley are just some of the names that make it into the songwriting credits. Every single one of these songs feels carefully selected, is cohesive with the mood and style Courtney wanted to present, and worthy of being re-recorded. Though the list of songwriters may be diverse, everything that pours out of Courtney Granger’s mouth sounds like the second coming of George Jones, and this isn’t by happenstance. Maybe some who’ve never been down to the juke joints and honky tonks of Louisiana may be surprised to find that country music from just across the Sabine River in Texas is a big player, but looking at a map you can see that George Jones’ hometown of Beaumont is just a hop, skip, and jump away from Cajun country, so there should be no surprise his incredible, Hall of Fame country voice spread through the bayou like wildfire from the 60’s, all the way through the late 80’s, and still holds real estate in the juke boxes of the true honky tonks in the region today. It was that exposure to George Jones and others that instilled a classic country passion in Courtney Granger from an early age, and this cross country / cross state influence comes roaring to the surface in Beneath Still Waters. And just because Courtney comes from the Cajun community, don’t expect to hear a bunch of squeeze box and gumbo references in this music. Beneath Still Waters is classic country to the core. If it’s guilty of anything, it’s of being too country, and too dry and non-diverse in how it serves up one slow classic country crooner after another. Helping create this record with Courtney are the formidable Dirk Powell acting as producer and guitar player, and other recognizable names from the Cajun and roots community such as Laurie Lewis and Tom Rozum, vocalist Alice Gerrard, and Cajun fiddler Joel Savoy. Beneath Still Waters is officially an album of non-original material, and so you have to preface it as such when weighing it beside classic country records of new material being released. But shoving that concern aside, Courtney Granger delivers a surprising, touching, well-rounded, and frankly stunning performance of classic country tunes made anew by the power and passion behind his voice. Also, George Jones lived a while in Carencro, La. The heart of Cajun country. Allegedly this is where the famous incident happened where they took his keys, so he took a tractor into town and bought a car. Nice voice. Gonna check this out. Thanks. Wow! Thanks so much for bringing this to my attention. Thanks Hearth Music for good promotion. Great traditional country music. 2016 has been very good year for fresh old timey country music with wonderful albums from Caleb Klauder & Reed Wilms, Courtney Granger and Pat Reedy.